On popular demand, we can now offer: ONLY 1 NIGHT NATCON. Price: 2.900 THB. Join Saturday anytime after 9 AM, participate all day, including lunch and dinner and leave Sunday after breakfast. Accommodation is in the mixed gender dormitory (see description below). This offer is ideal for members, who are not able to take Friday off from work or who have to work half day on Saturday. We are unable to offer group transportation but can advise you on various options. Anyone with a an existing reservation is not qualified for this offer. Facilities FREE: TV, WiFi in every room. ATV's 250 thb for 30 min. Banana Boat 2500 thb for 30 min. Jet Ski 1500 thb for 30 min. 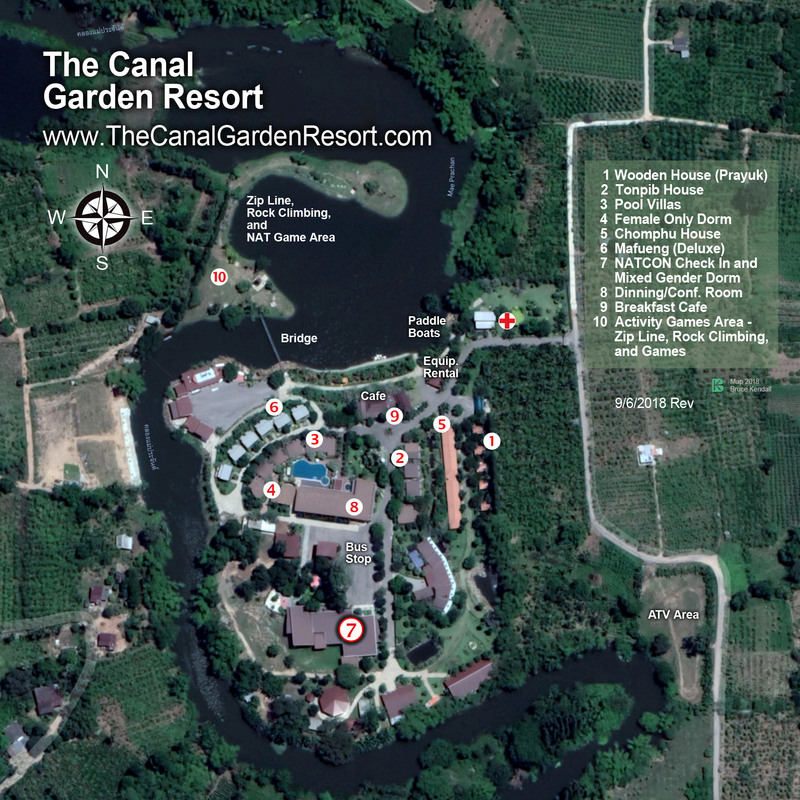 The 12 beds female only dormitory at The Canal Garden Resort is similar to the larger dormitory. It is for women who prefer an environment, where men are not allowed to enter. The beds have new and comfortably soft mattresses. Each bed has a locker with own key for private belongings and safety. The dorm has a its own living room and a big and clean shared bathroom. 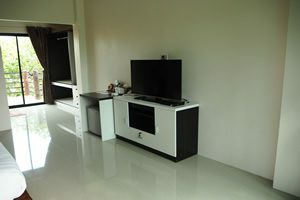 1 Single Bed in Baan Chompu double room --- SOLD OUT ! 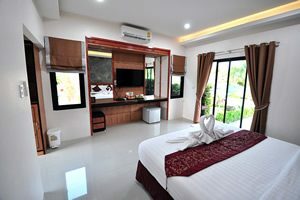 Two of the rooms named "Baan Chompu" have two single beds instead of a double bed. It is a 45 sq.m. 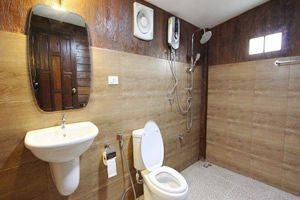 room with own toilet and own terrace outside. The beds have new and comfortably soft mattresses. 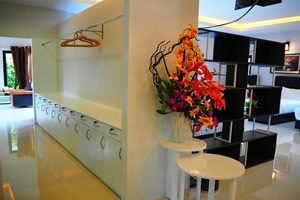 It is ideal for singles who find a dorm two noisy and uncomfortable and are OK to share a room. 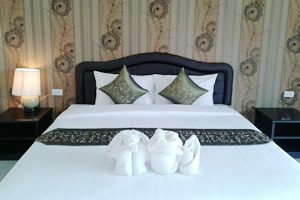 Baan Chompu double room for 2 people --- SOLD OUT ! "Baan Chompu" rooms are in a row of rooms, all on ground floor. You have your own toilet and your own terrace outside connected to the other terraces of the neighbours. 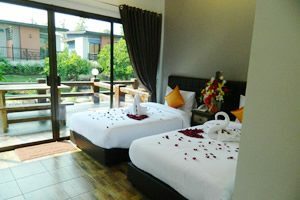 It is ideal for couples who like to stay in their own room but don't need the big space or luxury interior. 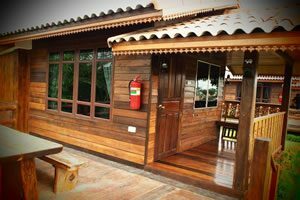 Single wooden house "Baan Mai Prayuk" for 2 people --- SOLD OUT ! "Baan Mai Prayuk" bungalows are stand alone houses. They are 35 sq.m. and all have rooms all have large double beds. Inside you have your own toilet inside and outside your your own terrace. The beds have new and comfortably soft mattresses. 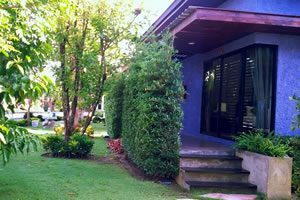 Baan Tonpib House for 2 people --- SOLD OUT ! 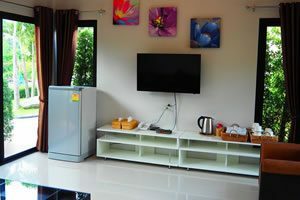 "Baan Ton Beep" are modern style accommodation. They are 40 sq.m. and all have rooms all have large double beds. You have your own toilet and your own terrace outside. The beds have new and comfortably soft mattresses. View to Japanese garden and the Chompu rooms. 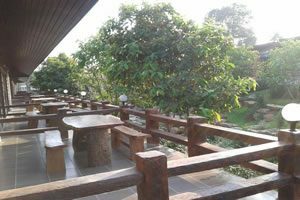 Baan Mafueng house for 2 people --- 4 ROOMS LEFT ! 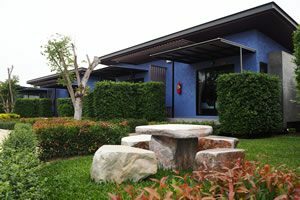 "Baan Mafueng" houses offer new, clean and modern accommodation on ground floor. They are 40 sq.m. and all have large double beds. 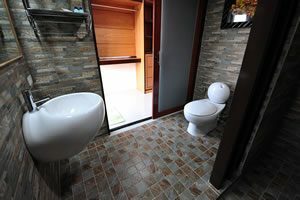 Toilet is stylish and outside you have a small terrace. The beds have new and comfortably soft mattresses. They have a great view of the lake and river. 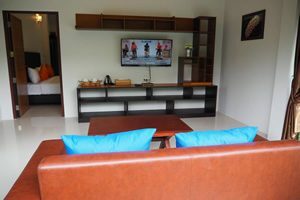 Big Pool Villa for 2 couples (for 4 people) --- 3 ROOMS LEFT ! The Luxury "Pool Villa" rooms are right next to the pool and very large, 100 sq.m. 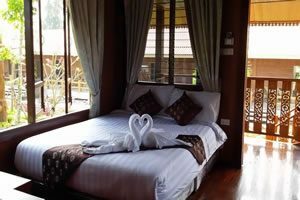 They have two separate bedrooms, each with a big double bed and each bedroom also has its own private bathroom. 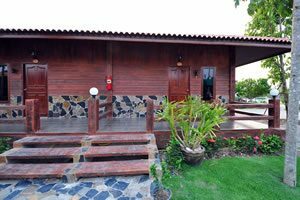 The Pool Villa's are ideal for two couples who prefer to stay together. They also have their own living room with TV etc. NATCON is a great gathering of naturists from literally around the world. This photo is from last year's conference. Great Khun Ron! One day we will have a prize for most persistent participant – that will be yours! It’s getting bigger and bigger.. Great work Gregers.. I would book it right away.. 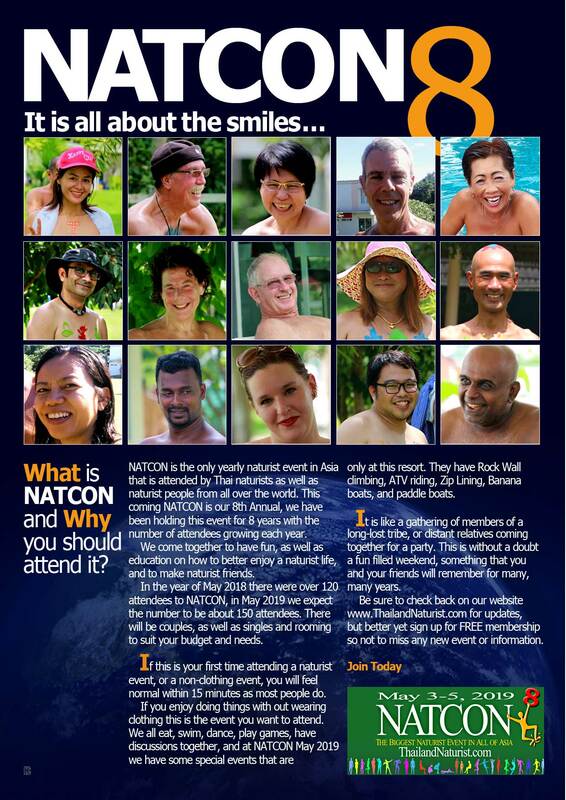 I will be join 8th NATCON with a some more new Indian naturist. Great if you can make it again – and yes, please bring some friends! 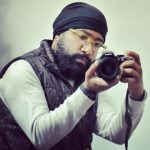 The experience of NATCON 2018 was very wonderful! I want to participate next year too! Did you see: Rock Climbing, Ziplining, and ATV’s….holy cow….wow…. How did you manage to get a holy cow for the event? I know it may be too early to ask these questions but here goes. 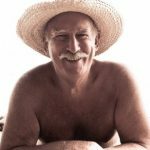 – will there be transport from the various naturist resorts in thailand to Natcon ? – are meals covered in the cost of the booking? i’m guessing we can still buy food from the resort? Naked hugs to all ! Good questions all of them. Let’s take them one by one. 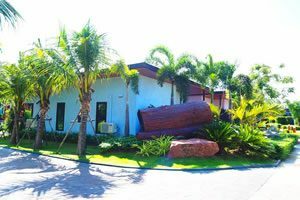 There will be transport from all the resorts to NATCON like last year. Meals are included. But they have a restaurant where you can order a la carte. And they will have beer and stuff for sale. Parties? Hell yes! We try to offer some serious workshops too, but the partying will start from 1st and continue after NATCON, too, for sure. I am excited for this year too. Already booked the complete trip.